The conservative Merkel had reportedly been skeptical about the “zero option” for nuclear energy. After Japan’s Fukushima calamity in 2011, however, she abruptly changed course, endorsing the phase out of all nuclear plants by 2022. Meanwhile, Germans have invested heavily in wind and solar power, encouraged by a generous “feed-in tariff” that guarantees prices and priority access for any renewable energy fed into the nation’s power grid. Renewables now supply about 22 percent of Germany’s energy, compared with nine percent in America. Bavaria is not exactly the Costa del Sol, but it generates more photovoltaic solar energy than the entire United States. These are impressive achievements, but the costs of going green in a hurry are becoming unsustainable. For German consumers who ultimately foot the bill, the tab for renewable subsidies comes to $32 billion this year, and soaring electricity bills are hitting households and businesses hard. The Energiewende also requires construction of a costly and extensive new infrastructure of high-voltage transmission lines to carry power from northern wind farms to the industrial south. The spreading visual blight has sparked local outbreaks of Nimbyism. “Germany’s electricity prices are already the highest in Europe, 40 to 50 percent higher than the EU average and twice as much as in the U.S.,” notes Jurgen Kronig, a prominent Energiewende critic who writes for the German weekly Die Zeit. Industry and labor also are sounding the alarm about the policy’s impact on Germany’s finely-honed export machine. Manufacturers there have adapted better to globalization than their counterparts in most other high-wage countries, but energy-intensive industries like autos, paper, chemicals and basic metals have suffered substantial net export losses in recent years. German and other European companies are looking to expand production in the United States as the shale gas boom lowers energy prices here. “We simply have a gigantic problem in competition with the United States,” conceded Sigmar Gabriel, Economy and Energy Minister and the author of the government’s new plan. To keep energy costs from overwhelming German’s comparative advantages in precision engineering and quality, the government has been forced to dramatically expand the number of companies that are exempt from the renewable energy surcharge. The government’s new plan reduces that number, but Gabriel is clearly worried that the EU might label Germany’s surcharge exemptions as a trade-distorting government subsidy to exporters. The Energiewende aims at making Germany a green energy powerhouse and global leader in the fight against climate change. But, in a cruelly ironic twist, Germany’s greenhouse gas emissions are going up, not down. Wind and solar are intermittent sources of energy that require backup from conventional plants. As nuclear power generation shrinks (down from 25 percent to 16 percent of consumption) Germany has been forced to rely more on fossil fuels to keep the lights on. Going green, it seems, also means going brown: Germany is importing more relatively cheap coal from the United States and Russia, and building new coal-fired power plants that use lignite, an especially dirty form of coal. Meanwhile, the Ukraine crisis has illuminated another indispensable pillar of the Energiewende – Russian gas. Germany gets about a third of its natural gas and oil from Russia. This surely has to factor into Berlin’s calculations about how forcefully to respond to Vladimir Putin’s annexation of Crimea and his ongoing campaign to destabilize Ukraine. In light of Moscow’s cynical reversion to nationalism and power politics, it behooves Germany – and eastern European countries, which rely much more heavily on Russian fuel – to start winding down fuel contracts with Moscow and looking elsewhere for energy. As it happens, Germany may not have far to look: IHS Energy, a research and consulting firm, estimates that the country has enough shale gas to replace all of its Russian imports. Even so, the prevailing green ideology blocks efforts to tap this resource. All of this suggests that Germany’s nuclear-phobic turn has drastically narrowed its energy options. Moreover, if averting global warming truly is your overriding priority, it makes little sense to rule out zero-carbon nuclear power. U.N. scientists recently said that to keep climate change within manageable limits, the world will need to triple the energy it gets from low-carbon sources – including nuclear reactors. Germany’s energy travails suggest that the United States would be wiser to stick with President Obama’s “all of the above” approach to balancing economic and environmental goals. Renewable fuels should and will pay a larger role in meeting the world’s energy needs, but attempts to press the pace of this shift too hard will likely backfire. Next entry »Is confrontation with Russia inevitable? « Previous entryWhat we're reading: U.S. reverting to the Gilded Age? Germany is taking the lead in green, renewable energy and they're being demonized ?! This move began with legislation by the democratic party in 2000 and is now being protested by none other than their republican counterparts. My question is, Why, when anything is good for our planet and bad for the profit margins of dirty energy, is the dismantling of something always championed by republicans ? 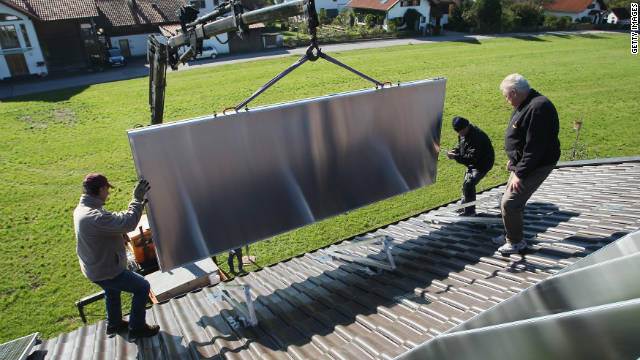 The subsidies propping up renewables is breaking the back of Germany. And the waste associated with renewables is being ignored, right now renewable providers are getting a free pass. Indirect land use, waste byproducts,and exaggerated yields will all be exposed. Germany is exporting their economy/jpobs and CO2 to China, so there is no net gain although they can claim the higher moral ground. They pray for their prey to be subservient to their wishes. But they must pray, for the prey that they prey upon don't give them a prayer of hope. And by the way, Amen. Agreed @ bobcat and happy good friday to you! And right back atcha chrissy. Good to see you again. Hope this finds things leveling out for you. Im very sorry @ bobcat that i hadnt responded to your posts earlier. Im not used to one word posts from you so i just thought they were you no who lmao! Looking for a good read? Check out my true book Surviving Bigfoot and the Dixie Mafia. It is free to read online. Soon to become a motion picture. I am certain you will enjoy it. I apologize as well chrissy. It's true, I am usually more inclined to embellish my conversational tendencies with the usual blather that is inherent on these pages. But in an attempt to harness these tendencies, I have become a man of few words. Now, if you believe all that, I should be able to convince you to put your money on the Lions to win the Super Bowl this season. But enough of all that gobbledygoop. How have you been doing ? The last we spoke, you were being inundated with all sorts of not goo things. Well as much as I like Germany the most green country in Europe is probably France. I think somewhere around 60% of their power comes from nuclear. I went to a conference in Germany talking about green power there and while most Germans want green non nuclear power it has not dawn on them how expensive it will be. Meanwhile most of their Power now comes from coal. I have to say though they are working on many ways of saving energy, using less of it and batteries which can store more. So there will be some surprises yet to come. I do not agree with you that nuclear energy makes france the greenest country. In case you do not know:nuclear energy gives the worst waste you can imagine. In germany they have put the waste into old saltmines and now the containers started eroding quicker then expected. That is no my idea of a greener. It's no different in the U.S. The states are adding new taxes to offset revenue lost from electric cars, that don't use gasoline. It gets to be a joke. The joke may be in the coal used to power the lines that charge the electric car. It's just a very subtle joke. Germany exports Billions in green tech products, which produce jobs. This will never work in America; where the GOP prefers to only support service industry jobs that pay minimum wage. Pretty good article all around. Renewable energy is a desirable outcome, but indeed, gotta be cautious about spending too much money on a fledgling industry too. Good that research and implementation is on-going and improving though. where is my earlier comment? Why does nobody see the plain NECESSITY for renewable energy, no matter what the price? Whenever it comes to renewables, everybody suddenly seems to see only the cost that comes with them, not the benefits in the short and long term. See it as an investment in the future – our own and more importantly that of our children and grandchildren. Unsustainable you say? It is the way we have been using energy until now that is completely unsustainable, and leaving our planet in tatters for coming generations to "enjoy". The price tag associated with renewables will eventually go down and is already minuscule in comparison with dirty energy. Why continue on a path that we all know but don't dare admit is erroneous and destructive? Interesting how everyone is against nuclear, but it is the gas, coal, and the manufacturing of the necessary heavy metals for renewables that is creating the Global Climate Change which is purported to destroy the planet, not the minor volume of nuclear materials. Have not seen any comments about how long the CO2 from coal and gas lasts, my recollection is it is killing the glode and last longer than the nuclear materials everyone is so worried about. In Germany there is also a Green Fashion Brand called : FUKUSHIMA Streetwear Fashion Label – Social & Ecological. They use renewable enegie to produce organic cotton... Very courageous idea! Usually I do not read post on blogs, however I wish to say that this write-up very pressured me to try and do it! Your writing style has been surprised me. Thanks, quite great post.